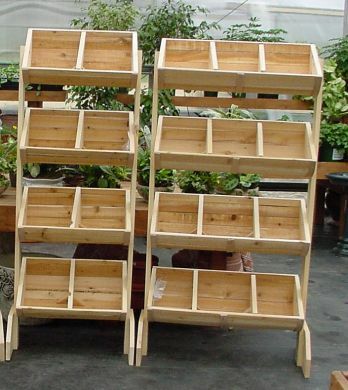 Our stacked four bin vertical display units are available in three sizes. They are constructed with beautiful rot-resistant Northern White Cedar and are available in natural or stained finishes. The adjustable dividers make them easy to use, and you can even order extra dividers to further customize your display. Please feel free to contact us if you need more information or have any questions.